Two critically endangered leopard cubs were born at a Connecticut zoo earlier in the year, stealing the hearts of zookeepers and animal lovers alike. Connecticut’s Beardsley Zoo made the announcement last week (March 7) that the incredibly rare leopard cubs had been born at the park in January, and are currently being cared for. 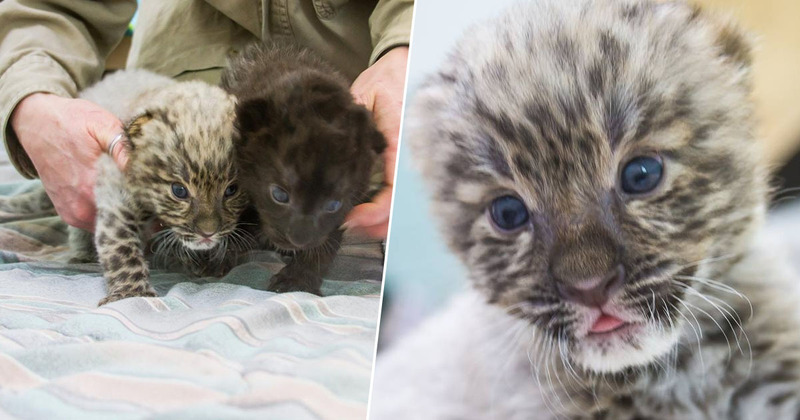 The two Amur leopards – a boy and a girl – were delivered on January 25, along with a third sibling which sadly passed away shortly after birth. Amur leopards are a critically endangered species, with the World Wide Fund for Nature (WWF) estimating only approximately 80 of the leopards exist in the wild. As such, they are on the verge of extinction – hence why the news of the two adorable cubs’ birth is so incredible as each newborn cub is vital to the survival of the species. Taking to social media last week, Connecticut’s Beardsley Zoo posted three pictures of the tiny cubs – who are yet to be named – alongside some information surrounding their birth. The zoo explained how the cubs’ mother, Freya, gave birth to three cubs towards the end of January. However, only two survived and the other cub (a boy) died as a result of his mother’s hyper-grooming behaviour. According to Earther, this behaviour is normal for a first-time mother – which Freya was. In fact, the zoo’s deputy director, Don Goff, told the publication a female leopard may lose her entire first litter because of this behaviour. You have to be a little extra careful with first-time mums. You never know how they’re going to react. It’s not like someone told them they are pregnant or why they’re going through all these changes. Because of this, the surviving cubs were taken away from their mum when she began to pose a risk to their well-being. The female cub in particular had to undergo lifesaving surgery shortly after birth and lost her tail, but is now recovering. Today our little female Amur leopard cub takes center stage. She is one of only two "melanistic" Amur leopards in the U.S., and thus is extremely rare. Photo by Sandy Sprague Stone. The female cub is particularly rare as she has melanism, an extremely rare black color variant in big cats. There is currently only one other melanistic Amur leopard in the United States, at the San Diego Zoo. Amur leopards are on the brink of extinction. The Species Survival Plan’s breeding recommendation is designed to bolster the number of individuals in human care, for potential future breeding, as well as the opportunity to return certain members of the species back to the wild someday. The birth of these cubs brings a few more precious Amur leopards to the population, which can help ensure the survival of these majestic animals for future generations. A beautiful baby face. This is our six week old male Amur leopard cub, an ambassador for his species. The Association of Zoos and Aquariums Photo by Sandy Stone. Veterinary and animal care staff at the zoo are providing around the clock care, hand feeding the cubs five times a day with a feline milk replacement formula. In the six weeks since they were born, both cubs have increased in weight, with the male being slightly larger than the female. The zoo says the cubs’ survival to six weeks is a ‘critical milestone’ and it will be several more weeks before the public will be able to see them.